Shake can vigorously before each use. Turn can completely upside down to dispense. Point can towards fluoride applicator tray and slowly press the nozzle to fill tray. Use one press per arch, as foam will expand slightly to fill the tray. Dry tooth surface and insert tray(s) in mouth. Have patient bite down lightly but firmly for 1 to 4 minutes. Remove tray(s) and have patient expectorate excess. Instruct patient not to eat, drink, or rinse for at least 30 minutes after application. The first time you dispense from a new bottle, gently lift upward on the nozzle to break the protective shipping tab (thin plastic tab located adjacent to "trigger"). If this tab is not broken, there could be an initial surge of foam from the dispenser. Sodium Fluoride in a proprietary acidulated phosphate flavored foam base. 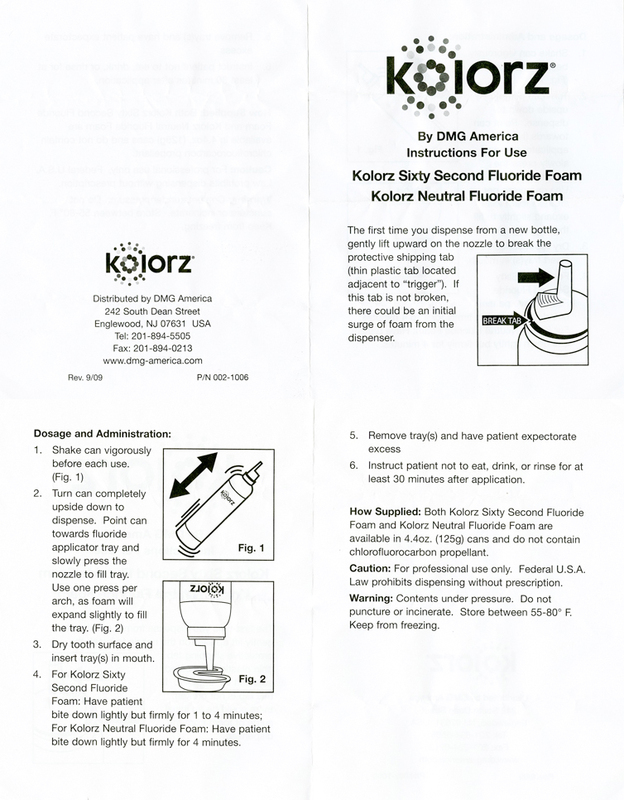 1.23% Fluoride Ion is available from 2.72% Sodium Fluoride. Does not contain chlorofluorocarbon propellant. Sweetened with Sucralose. Does not contain Aspartame or Saccharin. Gluten free. WARNING Avoid spraying toward open flame. Contents under pressure. Do not puncture or incinerate. Keep out of reach of children. Store between 55-80 F. Keep from freezing. For professional use only. Federal U.S.A. Law prohibits dispensing without prescription. Shake well before each use. 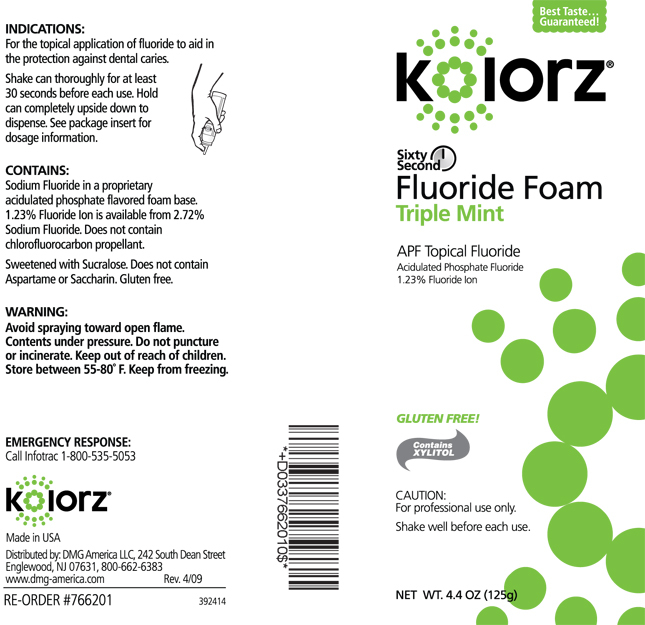 Kolorz Sixty Second Fluoride Foam is available in 4.4 oz. (125g) can and do not contain chlorofluorocarbon propellant. For the topical application of fluoride to aid in the protection against dental caries. Shake can thoroughly for at least 30 seconds before each use. Hold can completely upside down to dispense. See package insert for dosage information.